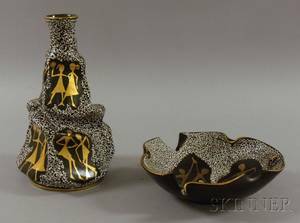 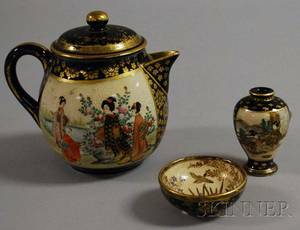 Three Satsuma Gilt and Enamel Decorated Pottery Items, a teapot decorated with a family in a landscape, a small vase with ladies in a courtyard, a small bowl with flowers and bird in a landscape, ht. 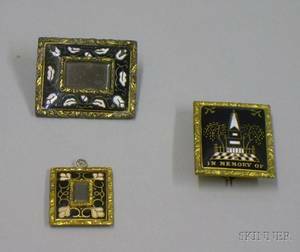 1-4 1/2 in. 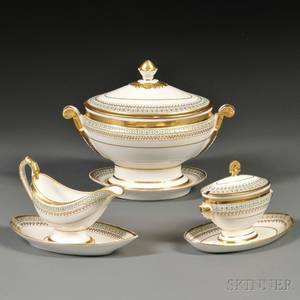 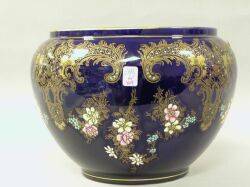 European Gilt and Enamel Decorated Cobalt Blue Glazed Pottery Jardiniere. 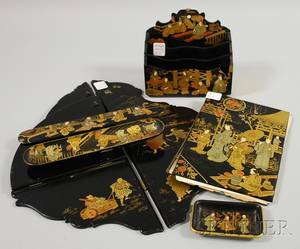 Five Japonesque Gilt and Enamel Decorated Black Lacquered Desk Items and a Folding Corner Wall Shelf. 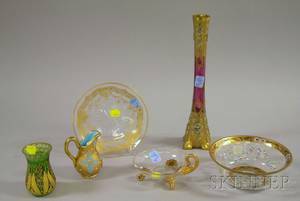 Six Gilt and Enamel Decorated Art Glass Table Items.